Tankless water heaters are preferred by consumers for their ability to last to last longer compared to tanked heaters. They also go a long way towards reducing your gas bills. Investing in the right tankless heater for your home’s needs is the only way to get the full range of benefits. 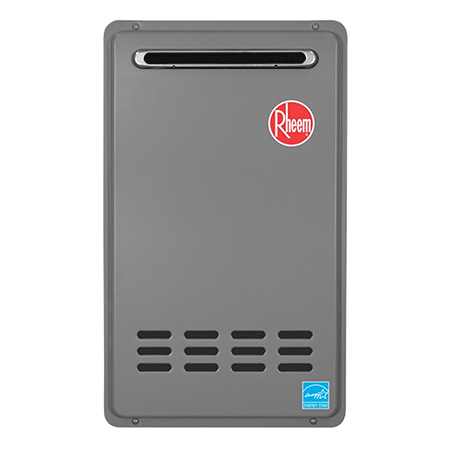 That said, Rheem is one of the most reliable manufacturers and provides tankless heaters that guarantee continuous supply of hot water. 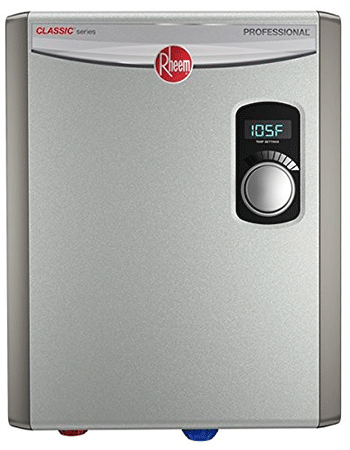 The first thing you will notice about the Rheem RTX-04 is its stylish appearance. Its design incorporates high quality immersion heating elements that are corrosion resistant. The digital temperature control allows you for one degree increments or decrements from 80 to140 degrees Fahrenheit. This heater is equipped with one heating element that operates at 120volts. Like all RTX heaters, this one comes with two durable copper immersion heating elements that are field serviceable. The external digital thermostat control has an LED display for clear visibility and offers a +/-1 degree accuracy. Threading allows for easy installation, replacement of parts as well as digital temperature display. In addition, the bottom ¾ inch NPT water connections make installation easier. 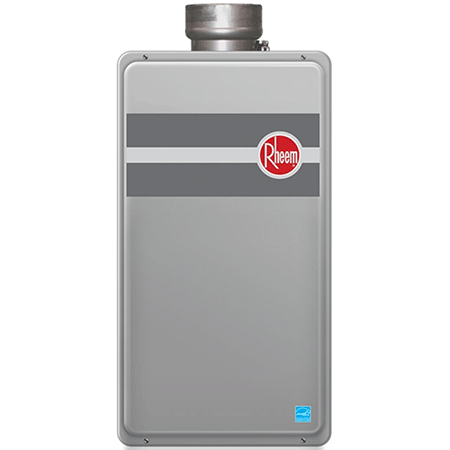 This is a tankless water heater loved for its compact design, energy efficient system as well as top performance. The heater is Energy Star certified and can heat up to four gallons of water in a minute. 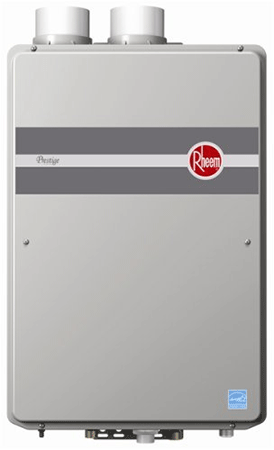 It also features the patented Rheem energy efficient system, which goes a long way towards reducing your energy bills. The on-unit temperature offers nine different heating levels and an LED display that indicates the active elements. Other features include 1/2 –in water connection and copper heat exchanger. 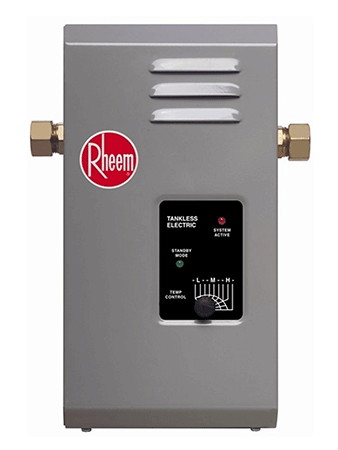 If you are in the market for a natural gas unit, the Rheem RTG-84DVLN will prove a worthy investment. Among its range of inciting features is a flow of 8.4 gallons of water depending on how warm you need your water to be as well as where you live. The heater requires about11000-180000 BTUs of heat, which again depends on where you live. At 54 pounds of weight, this unit isn’t as compatible as other heaters on the list. The low NOx system allows for indoor installation. 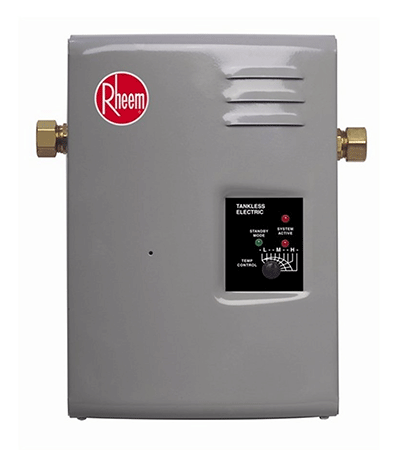 There are many benefits and tons of great features that come with the Rheem RTE-27. For starters, it is Energy Star certified and has an on-unit temperature control. The rugged brass/copper heat exchanger increases reliability and durability. This unit can heat up to 5.0 gallons of water per minute, which is expected given its size. LEDs do a great job of indicating the active elements as well as standby mode while the compact design saves on space. 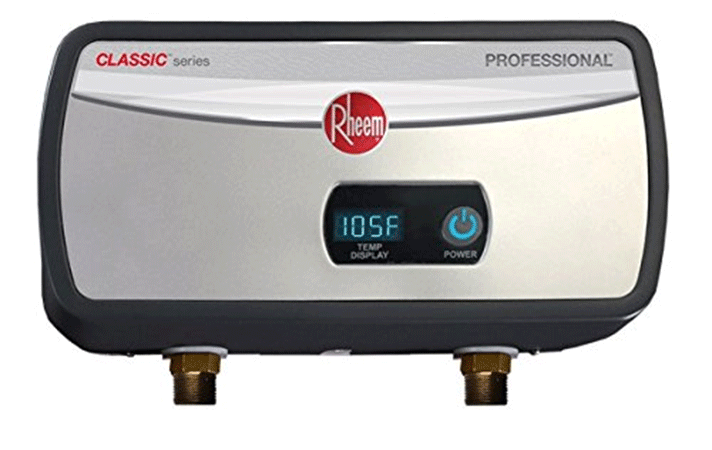 Areas that require hot water in small doses will benefit a great deal from the Rheem RTE-7. This heater is perfect for rural areas and RVs. It only weighs 6.2 pounds and can heat up to 1.5 gallons of water per minute. Like other models on this list, it is energy star certified and has an LED indicator that shows the status of the unit. The analog temperature control helps with modulation of power. This is another natural gas unit and offers a good flow of 6.4 gallons of water per minute. That’s more than enough to handle several showers at the same time. It requires about 150,000 BTUs and has a high efficiency rating of 0.82. At 54 pounds, mounting this heater on the exteriors and walls shouldn’t be that hard. Another notable feature is the special low NOx function that eradicates the need for complicated venting systems. 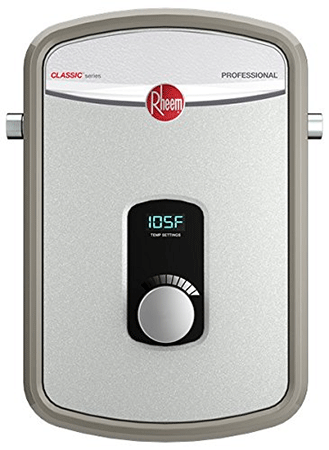 This tankless water heater is packed with a variety of great features including a flow of rate of 9.5 gallons, which is quite high compared to what other models offer. That’s more than enough to serve multiple kitchens and bathrooms at the same time. It requires up 199,000 BTUs which though high, you will be happy to know that the heater has a high energy efficiency rating of 94%. The unit weighs 80 pounds and features a low NOx function that prevents harmful emissions. 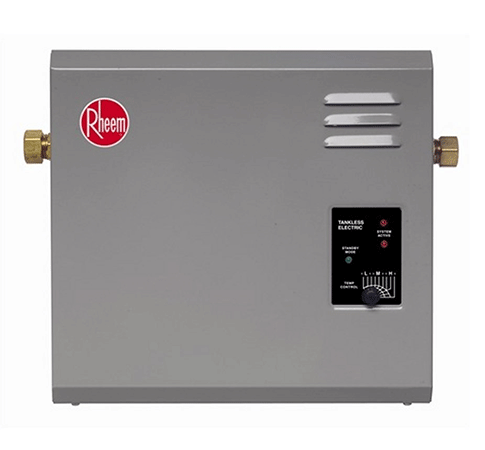 This tankless heater lives to Rheem’s standards by providing a continuous supply of hot water. Its plethora of features includes an external temperature control that allows for customization. There is a standby mode and LEDs that do a great job of indicating the active elements of the unit. The copper and brass heat exchanger is a welcome feature that allows for increased durability and which is backed by a ten year warranty. This will prove investment if you are looking for something that’s suitable for on-point applications. It is designed for single shower applications and can provide up to four gallons of water per minute. 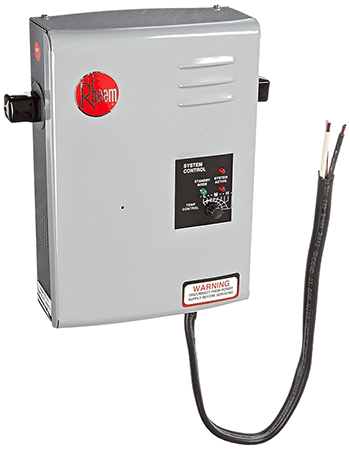 This 13kw 240W tankless heater comes with a modulating power control with nine settings that allows for customization. The contents are housed inside a metal box with a grey finish and 0.5” connections pipe water in/out of the unit.